A 3.6-magnitude early-morning earthquake on Saturday was the 25th of the year in France powerful enough to prompt a seismic alert, officials have said. The quake, on the border of the Charente and Charente-Maritime about 20 kilometres southeast of Jonzac, was the second in the region in less than three weeks. Its epicentre was just 12km from a 4.9-magnitude tremor that shook the same area on March 20. No damage was reported. Another earthquake on March 20, in Brittany, was unrelated to the Charente tremors, officials said. Seismic alerts are triggered when quakes of 3.5-magnitude or higher take place. In this latest case, the quake was monitored and its magnitude studied by experts. Local emergency officials are automatically alerted following quakes with a magnitude of 4.0 or higher. Officials at the bureau central sismologique français (BCSF) said the latest earthquake, some 30 times less powerful than the one in the same region last month, is most likely to be an aftershock, which can take place weeks or months after a more major event. Since January 1, some 25 quakes powerful enough to trigger an alert have been recorded by the BCSF. Although about 2,500 tremors are recorded in France every year, usually between 10 to 15 are strong enough to be felt by members of the public, the agency's Christophe Cira said. But the higher-than-average incidence of quakes in France is not an indication that more serious tremors are on the way, he said. "This seismic activity is not a sign of something much bigger, like the "Big One", the devastating earthquake threatening California. We don't have a fault of this size, which would go from Lille to Marseille," he told Le Parisien. "In Jonzac, we are talking about a 1km fault." Humans tend to sense quakes that register 1.8-magnitude or more, depending on the depth and epicentre, he added. 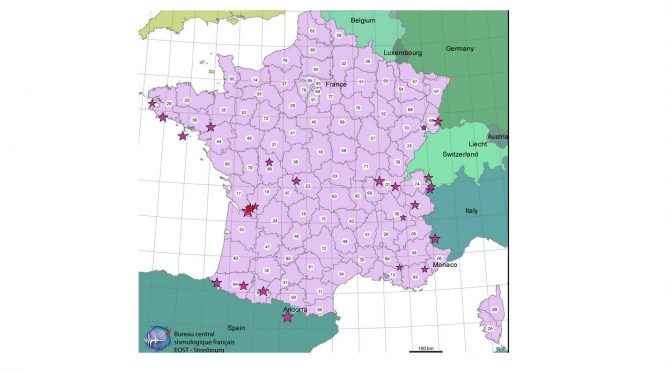 Nouvelle-Aquitaine is an area considered to be of 'low seismicity', officials said, but warned that there could be other tremors in coming days. In France, the most 'active' areas are in the Pyrenees, in the Alsace plain, which is crossed by the Rhine Plain (a depression that runs from Switzerland to Germany) and in the Alps. In 1909, an earthquake, measured retrospectively at magnitude 6.2, was recorded in Lambesc (Bouches-du-Rhône). It destroyed five villages and killed about 50 people.